1. Sift the flour and icing sugar into a bowl, add chopped butter and rub it into the flour with your fingertips until the mixture resembles coarse breadcrumbs. 2. Add the egg, vanilla and 1tbsp of cold water and knead until the pastry comes together. If it's still quite dry, add more cold water, and if it's too sticky add a little bit more flour. 3. Form the dough into 2 balls, flatten them into discs using a palm of your hand (they will roll out easier), wrap in cling film and cool in the fridge for 30 minutes - 1 hour. 4. In the meantime prepare the mincemeat. Place all the ingredients in a medium pan and cook on a medium heat for around 10-13 minutes, stirring from time to time, until the fruit is soften and the liquid is almost all absorbed. Set aside to cool completely. 5. Preheat the oven to 190C. 6. 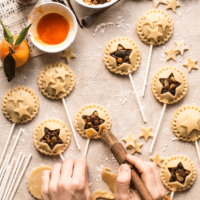 Roll out the first part of the pastry on a previously floured surface to about 5mm thickness and cut it out with a 6,5 cm round, crimped pastry cutter(or use a similar size glass or a jar ), you will need 30 circles for 15 pie pops. Use the leftover pastry to cut out the star shapes for decoration. 7. Leave 15 circles plain (that's the bottom of the pies), place the stick so that it rests in the centre of each circle. Place 1 generous teaspoon of mincemeat in the middle of each circle, leaving the edges. Brush the edges with water. 8. Cut out the stars in the middle of some of the circles that will go on the top of the pies or leave them plain to decorate with pastry stars later. Place these on top of the filling, pressing the edges together. You can use pie pop stick to press the pastry edges and leaving just about 1mm space between the presses. You can also use a fork to press the edges together. 9. Brush each pie with egg mixture, and decorate any plain top circles with some stars and brush the stars with egg mixture too. Bake for around 20 minutes or until golden brown. Repeat with the second part of the pastry. 10. Sprinkle with icing sugar before serving.